Is Detoxapet for Dogs & Cats? Detoxapet™ is safe for any size pet. 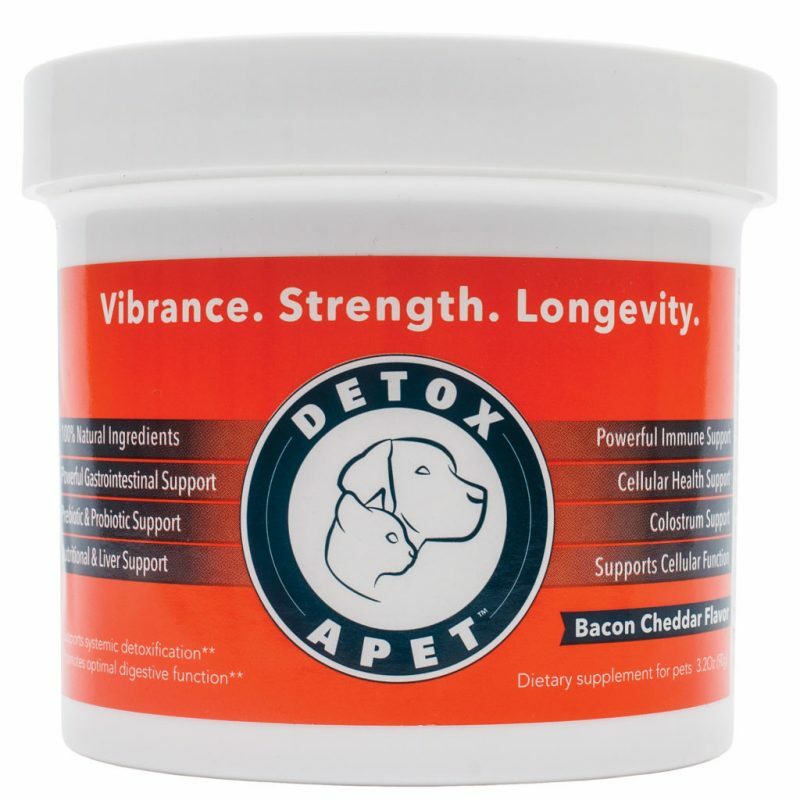 Detoxapet is NON-pharmaceutical. Detoxapet is a plant based, together with several important vitamins, non-GMO, all-natural, nutritional pet health product. You can feed your pet Detoxapet easily, and with confidence, knowing they are getting the best nutrition available today. What if my pet has allergies? Detoxapet has been formulated and developed for maximal efficacy, but using very safe ingredients that are very low allergenicity. 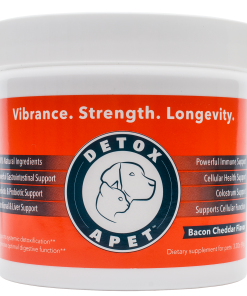 Detoxapet is formulated using non-GMO, 100% vegan, and are completely free of animal products, preservatives, gelatin, wheat, sugar, dairy, and SLS. We understand that many animals who will be given Detoxapet™ may not be in ideal health, so the formula is gentle, yet powerful enough to bring your pets back to their best. If you have any concerns of any specific ingredient, ask your veterinarian. Back in 2007, our dedication to science and research led us to conducting the world’s first published study (JANA Vol. 10, No. 2, 2007, page 38) on our own proprietary detoxification method, known as DETOXAMIN, used in 50 counties, and thousands of doctors and hundreds of thousands of patients worldwide. Because of our love for animals, as we are also pet lovers and owners, we started our research team to develop Detoxapet, using only the best natural plant-based, wholesome nutritional ingredients to produce real, noticeable and lasting results. 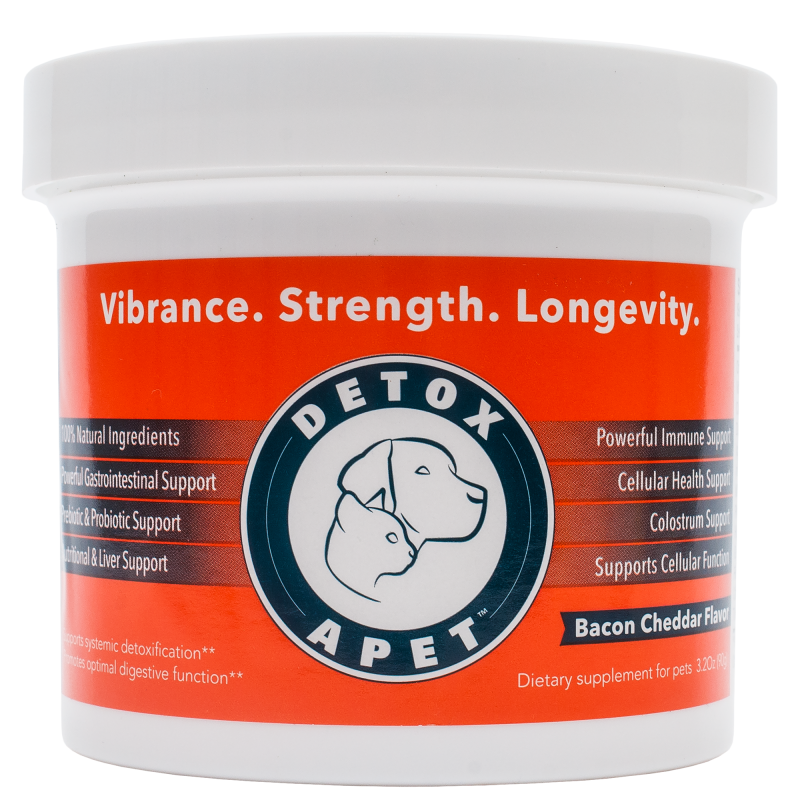 Our years of expertise is incorporated into Detoxapet, including our proprietary detoxification blend (Detoxamin Blend) which targets the specific toxic elements our pets our exposed to for safe elimination. We very confident that you and your pet will love Detoxapet, we offer you our 100% satisfaction money-back guarantee. It’s very easy, simply add Detoxapet powder to your pets normal food. 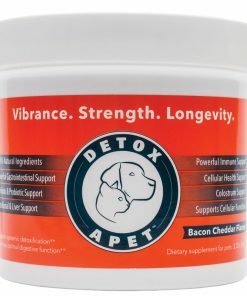 It is made with an all-natural vegan bacon-cheddar flavor that pets eat up, they really love the flavor of Detoxapet Most pets use one-scoop (provided) each day to their food. Adjust accordingly. 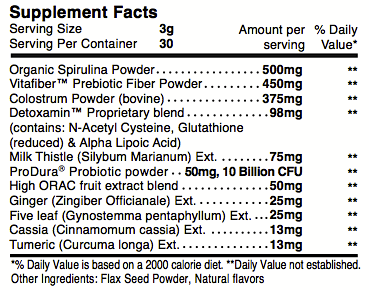 Plus, it’s packed with bio-nutrition, so don’t worry your pet is getting the best nutrition available. Detoxapet™ is manufactured in the USA. All Detoxapet ingredients are locally sourced from our own highly reputable suppliers, and there are absolutely no ingredients from China!